The former Carnegie Library building is under consideration as a possible site for a temporary Post Office. The unexpected closure of the Edgartown Post Office due to water damage was not on the agenda, but it was on everyone’s minds when Edgartown selectmen met Monday for their regular weekly meeting. The Post Office closure, and what to do about it, was added as an emergency agenda item. Town administrator Pam Dolby told selectmen, town officials, and concerned citizens present that damage to the building and the Post Office is worse than previously thought. Charles Hajjar, a Boston-based developer, is adding eight second-story apartments in the Post Office Square complex. The second floor of the building that the Edgartown Post Office and Martha’s Vineyard Savings Bank occupies is under construction. The Post Office has been closed due to rain leaks since midday Friday, when a powerful storm lashed the Vineyard. 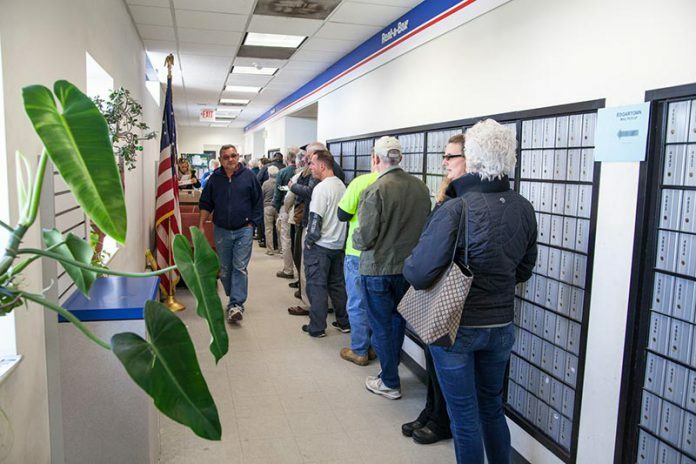 Mail delivery has been delayed, and Edgartown’s approximately 3,000 postal box customers have been directed to pick up their mail at the Vineyard Haven Post Office. Ms. Dolby described several proposals she has raised with U.S. Postal Service (USPS) officials. One would be to establish a temporary Post Office in a series of trailers behind the Edgartown Fire Department. “I found many situations across the country where they have put up portable trailers and moved the boxes to the trailers and put up a retail trailer,” she said. Another interim solution is to move Post Office operations to the small Post Office on Church Street, the main bus stop in Edgartown, until trailers are set up. On Wednesday, Stephen Doherty, a USPS public affairs spokesman in Boston, said there is “no timetable established to reopen the Edgartown location as of yet.” Mr. Doherty also said no alternative locations are on the table. “There are no other locations being looked at at this point, as this is expected to be a temporary relocation,” Mr. Doherty said. On Monday night, Edgartown Post Office customer Aushra Galley of the plumbing company KT Galley thanked Ms. Dolby for her work toward a solution. “As a business owner who relies on incoming mail … I’m really grateful,” Ms. Galley said. Ms. Galley described the temporary situation at the Vineyard Haven Post Office as unacceptable. Selectmen chairman Michael Donaroma said they didn’t think the situation could get any worse. “Hopefully the owner can get a bigger crew in there,” Mr. Donaroma said. Planning board assistant Georgiana Greenough told selectmen she has had difficulty working with the developer. Project heads are required to go before the planning board any time a project changes from the original plans. Ms. Greenough said that Mr. Hajjar did not have a permit, for example, to take down the roof. Building inspector Lenny Jason issued that permit, she said, but it still represents a major modification to the plan. 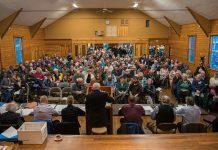 “If I was on the planning board, I would withhold that permit for the second half of this project until this problem is rectified,” selectman Margaret Serpa said. Ms. Dolby said she would provide updates on the town website after she touches base with Mr. Hajjar. At Monday’s selectmen’s meeting, bank CEO Paul Falvey said that “at minimum,” the ceiling has to come down, the building needs to be reinsulated, and there is damage in the basement. “The owners of the facility came into the bank and met with us pretty quickly, and offered to do things with us I think are pretty reasonable,” Mr. Falvey said. He described the opportunity to renovate as a “positive byproduct” of the situation. “Obviously, we wish this hadn’t happened,” Mr. Falvey said. Hours at other Martha’s Vineyard Savings Bank branches have been extended to accommodate customers during the closure.